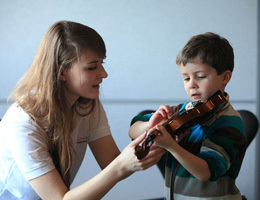 The London Philharmonic Orchestra runs Have-a-Go sessions as part of its FUNharmonics family concerts at the South Bank Centre, London and Stentor instruments are on loan to give children their first experience of string playing. Excited children, from age 2 to 12 queue up before and after each concert to ‘have a go’ on a Stentor violin, cello or double bass. For some it is the first time they have touched an instrument. Tutors offer advice on how to hold and play the instrument and answer their questions.